So, your little one has decided they want to be a wizard when they grow up, have they? It's not an easy life, but it's never boring! They'll definitely need to get their hands on one of these stellar looking Magic Wizard Costumes to get into the magical mood. Don't get us wrong, your little wizard-in training is going to need tons of practice to sharpen their wizardly skills. But looking like a real wizard is just as important, and everyone knows that some of the best wizards wear sparkly robes, with moon and star symbols covering them to help focus their mystical powers, and to help them look really cool! They also need to wear their robes while practicing so they know how to cast spells properly in long, flapping sleeves, since style and flourish is half of magic. The other half is a closely guarded secret (we hope it has something to do with eating a big, delicious breakfast), but we bet your little spell-caster will crack the code in no time. The best part of this wizard costume is that it'll give them a fun, magical look whether they're practicing their spells, putting on a showcase for their friends and family, or going on a fantastic adventure. 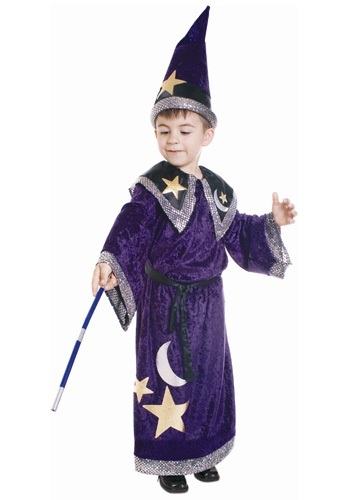 The roomy, mystically colored robe and matching cone shaped hat feature sparkly edges and satin accents, which makes them look like quite the powerful wizard as they practice their incantations. Before you know it, they'll be conjuring hexes, charms, and spells like a seasoned magical pro! This item is so cute as pictured, but unfortunately the quality is terrible. When I opened the package, the stars were literally hanging off the costume - barely attached. One side of the collar was also remarkably longer than the other. Returned!!! My 3-year-old son won a trophy for Best Costume with this wizard costume! !